Welcome to Papaleo’s Auto Body, Inc. and thank you for giving us the opportunity to serve you. 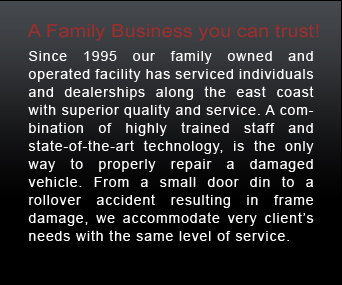 Established in 1995, we are a family owned and operated, fully licensed repair facility. In 15 years of business we have learned that the only two constants should be a superior standard of workmanship and first class customer service. We continually strive for customer satisfaction and retention. Along with affiliated companies, Papaleo’s Towing, Inc. and American Auto Rental - our mission is simple: “We’re here to help.” That is why we spend our resources on progressive and focused training along with having optimal equipment to work with. 1. No law requires you to get more than one estimate. 2. You are not obligated to use any particular shop to obtain repairs. YOU choose the shop and authorize the repairs. 3. The Insurance Company will NOT provide the warranty for your repairs; it is the collision shop’s responsibility. 4. While every single insurance company will say it’s concerned about safety, the bottom line is that we carry the entire liability for the repair. The insurance companies are off the hook, and they know it. 5. There is a big difference between shops. Any shop can give a lower price by leaving something out or overlooking parts. Our people are craftsmen and will do a good job of restoring your car at a fair price. Differences in repair estimates are common. A lower estimate may not include all necessary work. If you’re not sure why one estimate is different from another you’ve received, please ask us. We want our customers to know that the promise of a guarantee is not the same thing as a high quality, safe repair. The insurance company might tell you that if you don’t go to shops on their preferred lists, your repairs might be delayed, without warranty or with non-covered costs.